The rebec is a three stringed mediaeval bowed instrument, strung with gut and played on the arm, the chest or under the chin. Its origins lie in the similarly named Arabic rebab or rabab, which 12th century crusaders brought back from the middle east and north Africa. The rebab / rabab – still seen in Arabic countries today – has a soundbox made from a gourd, i.e. a leathery-skinned vegetable. The word ‘rebec’ begins to appear in Europe at the beginning of the 14th century, with the body now made from wood, since the northern European climate is too cold, damp and wet to produce gourds. This adaptation makes the rebec very much like a bowed gittern: both have a bowl body and both are carved from a single, solid piece of wood of a similar size, painstakingly chiselled out to produce the hollow soundbox. No music survives specifically for the rebec, in common with every other mediaeval instrument. 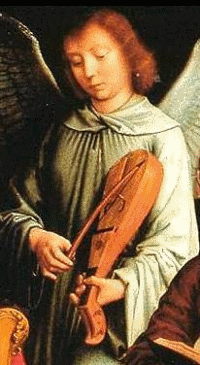 From around 1500 (by now in the renaissance) we see the rise of music written for individual instruments including, within the century, for the consort of viols (viols in different sizes and therefore pitches playing together) and the broken consort (a mixture of wind, plucked and bowed instruments playing together). The reedy sound of the 3 stringed mediaeval rebec would, one might have thought, have died out completely with the arrival of the much fuller sounding renaissance 6 or 7 string viol. Though there is no surviving music for it, the rebec clearly survived through the renaissance. An illustration marked 1590, collegium musicum or ‘musical meeting’ in Lauingen, Germany, shows an unusual (by English standards) mix of instruments in a broken consort, with a viola da gamba, transverse flute, lute, wooden cornett, leather cornett, harp, portable virginal and, very clearly and seemingly out of time, a slide trumpet and rebec. And in William Shakespeare’s Romeo and Juliet, c. 1595-96, Peter asks the musicians to play a piece called Heart’s ease. Shakespeare helpfully gives the musicians joke names to indicate their instruments, including one “Hugh Rebec”.